The Divide Peak gate on Romero Camuesa Rd (5N15) is only open to Middle Santa Ynez Campground. 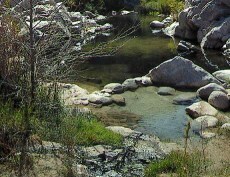 No vehicle access to Big Caliente, Rock Camp, P-Bar Flat, Mono Campground of Little Caliente Hot Springs. This road closure is in effect until further notice. Water levels at crossings are too high and there are mud and rock slides on the roads from the recent storms.